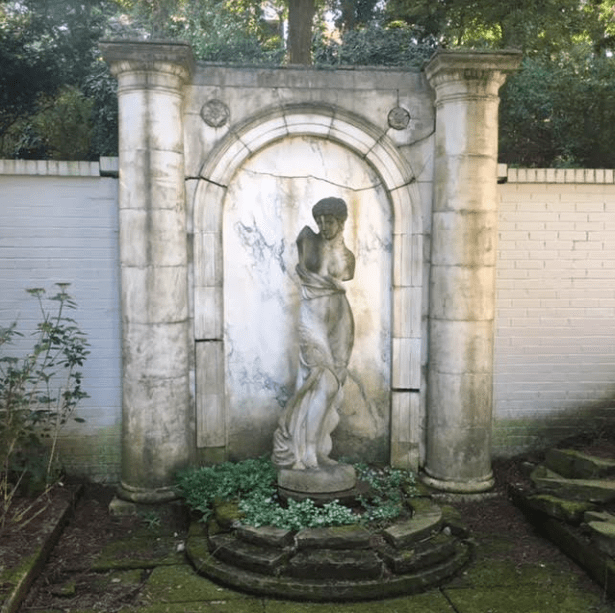 With its 6 bedrooms and bathrooms; its “huge formal rooms,” domed breakfast room and art deco bar; its in-ground swimming pool and several garages; and its lions and goddess statues, the old Stern family property has sat empty for a long time. The estate at 1830 Beechwood Blvd. rests near the corner of Forbes and Dallas, just south of Homewood Cemetery and west of Frick Park. Built of white painted bricks sprawling smoothly into a vast north-facing hillside, the emptiness of the bomb mansion now joins its gothic fixtures in lending it a haunted aspect. No one with the money to purchase such a single-family dwelling, upgrade it and maintain its “manicured grounds” really wants to reside in the heart of the city, I guess. 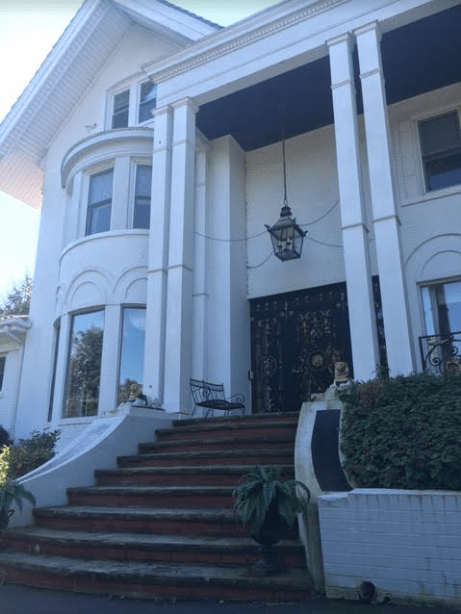 Now a deal worth $1.8 million is pending on the property, which last sold for $525,000 in 2002, and is assessed at $628,400 by the county. A construction company plans to demolish it all and develop eleven (11) new free-standing 3-4 bedroom condominiums to market at $900,000 apiece — for a grand total of just under $10 million. Meanwhile, I live about 80 feet diagonally up the wooded slope, high atop Mount Privilege, facing the opposite way. I don’t know how clearing, leveling and building space for about 40 souls to live, work and play is going to affect the topographical stability of my hillside. But I like my 1-car garage shed where it is, so I had to go to the community meeting. At the Squirrel Hill Urban Coalition as everywhere in Pittsburgh, a little old lady wearing a shawl boiled down the main issue: the developer is asking the city for a zoning change from Very-Low Density to Moderate Density, skipping over Low Density entirely. And maybe that’s too aggressive? In fact, the developers propose to pack homes in so like sardines, they need to ask for a whole separate zoning variance just to crowd the freestanding structures in a little closer together than ordinary. Community members also brought a host of related traffic concerns: the huge, steep private driveway empties onto Pittsburgh’s first marked Bike Lane, and there is a confusing “double 3-way” intersection nearby. Stormwater runoff was another widespread concern: the developer explained how he’d direct flows into a large new underground tank, to more slowly disperse it into City sewers. Somebody inquired over affordability, which was largely academic, but that’s how we discovered these 11 units were selling for almost a million dollars apiece. During the second half of this community meeting, and pertaining to a stretch of Murray Ave. further south, closer to Greenfield, an architect is proposing a new complex with 39 market-rate residential units and 60 parking spaces at the site of an old funeral home. This unleashed another round of traffic anxiety, as well as specific concerns from some nearby businesses and wellness centers. 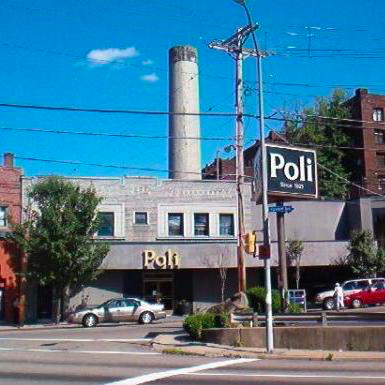 That is just up the street from the site of the fateful Poli’s fire, now an empty corner lot at the Murray, Forward and Parkway East intersection. That’s due to be redeveloped at least partially as affordable housing — which is great, except how there are no big, fancy restaurants in Squirrel Hill anymore. Speaking of convenient Squirrel Hill fires, 800 feet south of me and my hillside situation, the Pittsburgh Parks Conservancy just unveiled its brand new $19 million LEED-platinum Frick Environmental Center — at the site of the old Frick Nature Center, before that one leapt ablaze. Solar panels now loom over the parking lot, and geothermal ducts provide the center with cool water and energy. Hundreds of trees were torn down during construction, then thin new ones planted within each stump. A water feature carries storm runoff beneath a building access footbridge, somewhat suggesting Fallingwater, which then spills into new marsh lands. Refuse bins invite us to resign our waste to a Landfill, Recycling or Compost. The building itself is a glassy, boxy small events center, which includes new offices for the Parks Conservancy. It holds a kitchen, reception areas and a “PNC Classroom” which might easily be mistaken for a large conference room. Its stairwells and lower level are Brutalist, the geothermal wizardry all tucked away. An outdoor children’s amphitheater is a nice touch, at little apparent cost. The old Nature Center was a very modest nature museum. The new Environmental Center is an events hall and a grandiose demonstration — sort of a mini-David L. Lawrence Convention Center. 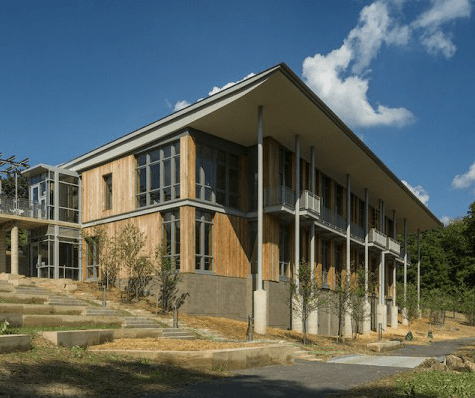 The $19 million price tag of this Frick Environmental Center doubled fitfully from the original $9 million envisaged in 2012. Of course, the Pittsburgh Parks Conservancy is a nonprofit and a philanthropic network, which funds park projects and programming in the City in exchange for some say over how the parks system is run. 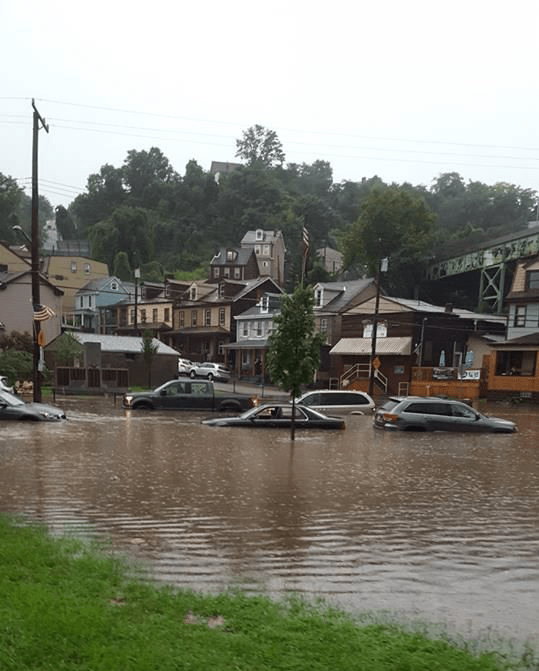 The Conservancy recently for example had consultants draw up a green stormwater management strategy that would fix notorious, longstanding flooding problems in Greenfield close to Schenley Park. That plan would cost $7.5 million to implement — less than half of one Frick Environmental Center — though it is unknown how soon such money will be made available for flooding relief. Ask around whether there is any room to restore Panther Hollow Lake by daylighting its stream, while also installing an innovationary, autonomously vehicular “Oakland Transit Connector” — and whether the mission to fund the two projects is or ought to be lumped together. Answers differ. In Squirrel Hill South, demand for higher and higher property values is already satisfied to the point that homeowners are concerned over sustaining neighborhood livability, which underpins such value in the first place. In Greenfield on the other hand, all I can say is Our Mayor is missing opportunities by hanging out with next gen industrialists more often than his working class constituents. This entry was posted in Uncategorized on September 14, 2016 by Bram Reichbaum. Thank you for your perspective on this. We had a simultaneous Squirrel Hill Historical Society board meeting (of all things) and thus missed the hearing. Did anyone ask, about 1830 Beechwood Boulevard (in which I believe my dad used to clean the carpets and furniture), why they would build detached houses, and then call them condominiums, while being so wasteful of energy – surely shared walls would provide much more energy efficiency? This sort of diminution of values – the lowering of zoning standards in a high-end area – only leads the way for other Real Estate Speculators to buy up other nearby properties and point to the fellow down the street, demanding another zoning diminution. It seems to be happening all over the city lately. Thank you very much for your mention of our neighbors in The Run, who are beset with strife and insult both. All of Greenfield stands behind them, of course. A big part of the problem with the runoff increasing has been PennDOT, and that is a whole other blog post. One elderly Run resident is now on her third water heater this summer, due to the flooding. Cars have been totaled. And this is not new, it is only getting worse. What is new is the idea that the City thought it would shove a road up their valley without asking first, and use the overage of the money garnered for that to help daylight the stream to help the runoff from the Parks Conservancy project (literally) and maybe begin to help their flooding problem. No one seems to think this is a fair exchange – 90 trips a day of a 25-passenger vehicle on a newly installed road where none had been before, in a quiet residential area where folks live for generations, in return for doing what reportedly had been the subject of a court mandate in 1958, fixing the sewer system under the Parkway and out to the river and PWSA. I repeat, without asking first. Yep, you have touched on a lot of it. They said they want to get some natural sunlight going between the buildings. I think it’s just for the prestige value of not being technically attached to another property. I didn’t know about this 1958 court mandate, but I know PennDOT loves to make things difficult, almost as difficult as the railroads. Is the new line to criticize PennDot rather than the Mayor? Is that how we do it now? The City is at the epicenter of this – not PennDot. The Mayor got bike lanes done everywhere else on “PennDot” roads when he wanted and when he decided to make the plea with PennDot. I can clearly see now that progress is stunted by the inability of some to criticize the all great one even in the face of halting those items which they hold near and dear. Besides, if we are stuck to just criticizing PennDot, PennDot has a boss you know. His name is Tom Wolf. Curious that we are now relegated to blaming things we don’t like on impersonal entities when we don’t want to criticize those that control the decisions. PennDOT has (a) not cut the vines that are killing the trees on its slopes that drain directly (down the old Four-Mile-Run path) into The Run, (b) clear-cut the planned water-soaking vegetation on the slopes of the underpass comprising the interchange at Squirrel Hill/Greenfield, planted grass which rejects water, and has since continued to kill all vegetation there as the weed trees try to take hold (this system of underpasses also follows the Four-Mile-Run path), (c) failed to curb the runoff from the Parkway itself, and (d) lied about the reasons for these matters. But maybe, Anon, you are correct and we should not accuse them of anything. Maybe somehow the Mayor is doing these things. The home you highlighted is not empty nor has it been for past 14 years . It is beautiful and worth every cent asked for on the market. plwase check facts before publishing articles. If it hasn’t been empty, that’s my mistake, but I’m around a lot and haven’t seen signs of use. It’s certainly beautiful and worth a pretty penny. Just want you to correct your statement. We live here. Unless you come on our property you would not know if we are here or not. Just shows what a private estate this is and a slice of paradise in the middle of the city. We are quite sure that it would remain quiet and a paradise when new homes replace this home . It is not a white elephant.. it is a beautiful white house on a wonderful piece of realestate unfortunately no one to date has wanted the privacy of a large estate offered here except the Senko Construction company. They are wonderful people they will make this a beautiful community and work with the people surrounding it. Change is good ,hard to accept by many but this will be great for this area we are quit sure. I mean this in the nicest way, really, but if the house is still beautiful and you are living in it, why is the word out that it must be demolished because it is moldy and cannot be repaired? That is (acknowledgedly second-hand) from the public hearing held by SHUC. That sounds like the potential Real Estate Speculator is trying to sell the Squirrel Hill low-density area a bill of goods. I was shocked at the accessibility-gaps with the new Frick Environmental Center. I too liked the outdoor amphitheater; but – (1) it has a long concrete stairway with no railing; (2) it has no equivalent seating area for a person in a wheelchair or someone unable to navigate the steps; and (3) there is no accessible way to reach the area where the “speaker” would be. None of these things appear to me to be difficult features to have designed into the amphitheater. A government body almost shouldn’t be capable of overlooking stuff like that, especially #1. I suppose the trail head at the adjoining park entrance (100 feet away from the main gate) is too steep for accessibility down to the amphitheater? As a veteran of planning decisions, I have learned that, unless there is at least one actually disabled person in the process, accommodations for us will be ignored. Reminds me of discussions of Medicare, in which people need constant reminding that the program serves the disabled as well as the elderly. One of the reasons I love Squirrel Hill…amazing people everywhere, hiding in plain sight! BTW, I hope I grow up to be that kind of “little old lady”!